I always haunt the local history section of both the Kent and Ravenna libraries, looking for new books about Portage County history. Since I am not a Portage County native, much of what I learn is new information – to me. For those of you who grew up here, perhaps this isn’t new information, but I would guess perhaps your children or grandchildren don’t have a clue about how Powder Mill Road got its name. During my last trip to the library, I was able to check out a copy of Loris Troyer’s book, Portage Pathways, and found a reprint of a November 29, 1987 column he wrote about Powder Mill Road. I have driven down Powder Mill Road many times; in fact, we use it as a short cut from our home on Cline Road to Rt. 59. I had often wondered what the origin of the name for the road was and I suspected there was probably a good reason why it was called that. According to Mr. Troyer’s book, the road was originally named Fox-Powder Mill Road, but somewhere along the line, the Fox part was dropped. The Fox designation probably came from a man named Fox who owned a large tract of land along the road, Troyer believed. In 1846, a man named Gillette, on land that (in 1987, at least) was a Kent State University biological area, established a gun powder manufacturing operation on the shores of Breakneck Creek. 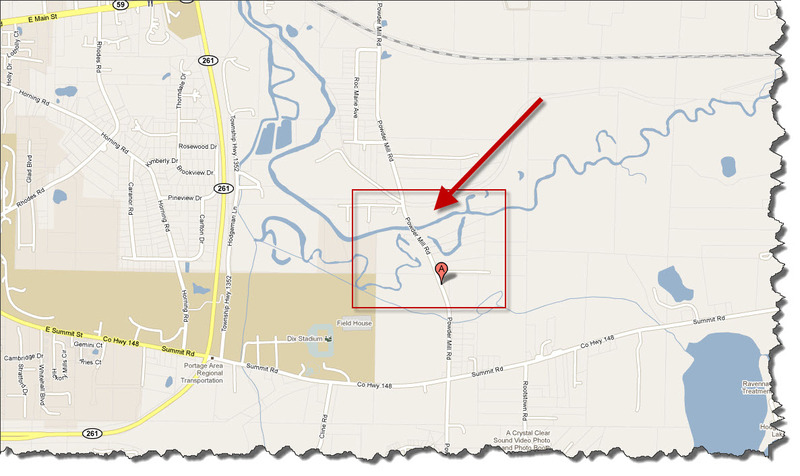 If you click on the image of the map above, you can see where I suspect the powder mill was probably located. I don’t know for sure, however, but since this is where the canal, Breakneck Creek and Powder Mill Road are in closest proximity to each other, it seems to make the most sense. The operation consisted of six buildings, two made of brick and the remaining four were wood-frame construction. Water from the nearby canal was used to power the grinding mill, then the water was returned to Breakneck Creek. That made me wonder what kind of “stuff” was returned to the creek – along with the water. It might make an interesting biological study to see what’s in the mud in Breakneck Creek…if there is any residue left? Anyway, the manufacture of gunpowder is not for the faint of heart, as there is some inherent risk in the process. According to Mr. Troyer’s account, on July 10, 1846, at 4:00 a.m. some 1,200 pounds of gunpowder and 2,000 pounds of raw materials for gunpowder exploded. The explosion leveled all of the mill’s buildings and the noise was heard in Ravenna. In Kent (called Franklin Mills at that time), the concussion from the blast shattered a large plate glass window in a downtown building. While there were no human casualties, two mules pulling a passing canal boat were killed and the upper structure of the canal boat was damaged. Poor mules! The mill was rebuilt a month later, however, and the operation on Powder Mill Road resumed. But the following January, there was another explosion and this time one of the owners was seriously injured and later died. But even this second explosion (and fatality) didn’t stop the owners of the mill. It operated until the 1860’s. It was known as the Gillette and Austin plant and also as the Oregon Powder Mills. The plant’s machinery may have been moved to the Austin Powder plant in Akron. That plant, said Troyer, was moved to Cleveland in 1867. As I said earlier, I am not a Portage County native. I was born and raised in Sandusky, Ohio – home not only to the world-famous roller coaster capital of the world (Cedar Point), but also to a now re-purposed arsenal much like Ravenna’s. I grew up less than a mile from the NASA Plum Brook facility, which, during World War II, was used to store military ordinance. During the space race in the 60’s, I can remember hearing loud noises emanating from Plum Brook. Someone told me they used to test rocket engines there during the race to the moon. Nowadays, there are other things going on out there having to do with the space shuttle program. My mother was a small child living on a farm very close to Plum Brook when it exploded during WWII. She has vivid memories of the explosion and fire that followed. Very scary for a little kid. Pretty frightening for my grandfather, too – who was working in Sandusky at the time. The arsenal was located outside of town in Perkins township, about five miles south of Sandusky. Another of my “connections” to the world of explosives and arsenals is my mother’s uncle, Lawrence Hartley. He was a truck driver who hauled explosives back and forth between the Ravenna arsenal and the Plum Brook facility. My mom still tells stories about his experiences. I always marveled at my uncle, who was a small man in physical stature, but in my eyes, driving a truck full of explosives was pretty darn brave. If you have memories of life living in the shadow of the Ravenna Arsenal, how about sharing it with us? This entry was posted in Family History, Local History, Portage County and tagged NASA, Plum Brook, Powder Mill Road, Ravenna arsenal. Bookmark the permalink.